With the extensive knowledge and experience in this respective domain we are engaged in offering Anaerobic Thread Lockers. 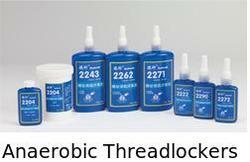 Our instant thread locker is used to lock and seal threaded fasteners, to prevent loosening and leakage. This instant thread locker is available in a wide range of strength and viscosity for many different applications. Our customers can avail this instant thread locker from us at affordable prices.